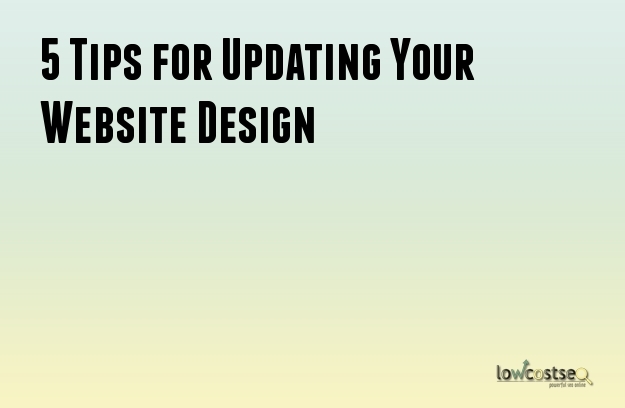 When was the last time you decided to update the look of your website? It is quite common to see people not making any significant changes to the design of their websites after they have launched it. This certainly means that the website begins to look a little outdated after a certain period of time. You need to keep looking for ways to modernize the website design. After all, people want a website that looks fresh, new and modern. You should not forget that the website is important. It is responsible for the impressions made by a potential customer. If you really want to be unique and stand out from the competition, a modern website can make a lot of difference. Once you have decided to make changes to your website, the next step is to identify the details which can make your website look modern and refreshing. The following 5 tips can be of help in that regard. There was a time when people wanted their company logos or icons to pop up in their websites. The purpose was to attract the attention of the visitors. However, that time has passed. Nowadays, flat surfaces rule the world of design. The screens of mobile devices, laptops and computers are all flat which makes flat designs the perfect choice. Microsoft, Android and Apple have begun to implement this design in their operating systems. Now, if you want to appeal to the customers, you will have to implement flat design principles in your website. It has become a well-known fact that the number of mobile devices in the world are increasing. This means that more and more people are beginning to use their phones to access the internet rather than a computer or laptop. In fact, experts are predicting that 2015 will be the year when Internet access through mobile phones will surpass Internet access through the computers. Instead of creating an entirely different website for mobile users, you can instead modify your original one. By making it more responsive in mobile devices, you can improve user experience. Parallax scrolling is one its way to become the most popular trend in website design. Parallax scrolling creates a fascinating 3D effect in your website. There are many brands and companies which have implemented this design technique for their website. This technique gives a remarkable boost to the performance as well. There are quite a few methods available for embedding a video in HTML pages. This is another trend whose popularity on the rise. Innovative design methods are becoming trends. However, the users will always prefer a website that provides them with information without overwhelming their experience. The website should not burden your users with visual information. Keep it as simple as possible. It is important that you keep changing your website according to the times. You would not like to see your customers get bored and leave because of your website design. Here is a fantastic infographic by digivate outlining the key principles of effective web design and its importance in relation to online marketing.